These Durable Sign Supplies With Whiteboard Panels Are A Great Way To Sidewalk Advertise With Custom Messages In Many Conditions! These Sign Supplies Are In Stock In Our Warehouse, So Don't Hesitate To Order! With these plastic sign supplies for sale online, you can produce, modify, and recreate colorful subject matters that are guaranteed to get recognized! These pavement marker boards provide adaptability, mobility, and simplicity that you won't discover in other outside signage. Each of these sign supplies include a double-sided 24" x 36" white signboard manufactured from corrugated acrylic. Additionally, we provide these food list boards four (4) colorful wet-erase markers that dry hard and do not leave residue on fingers or clothes. People can brush by or drag their fingers across your communication and it won't smudge off! Because they are weather proof, these marker pens won't wash off in the rain. Simply let the markers dry thoroughly before exposing your sign supplies to water. Despite the fact that these marker pens are smudge-proof and rainproof, you are still able to effortlessly modify your communication within moments. Your communication will wipe off effortlessly with glass cleaner and leave you ready to make more high-effect designs. 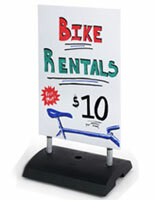 Our company sells these versatile sign supplies for exterior use with one black, green, red and blue marker pens. 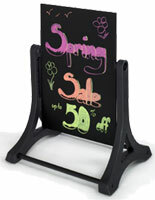 Weighing only 20 lbs, these sign supplies are quite portable and can be put together in just moments. While relatively easy to carry in comparison to several other outside signage models, these sandwich boards are long-lasting sign supplies that are stable in rain and winds up to 20 mph. The black frame of the menu board is fabricated of rustproof technopolymers with internal steel supports for stability. 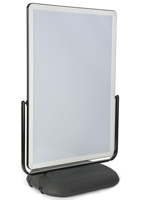 While these reliable sign supplies with two-sided whiteboard are built for strength, they also incorporate a modern design and gentle swinging motion that looks brilliant and commands awareness. 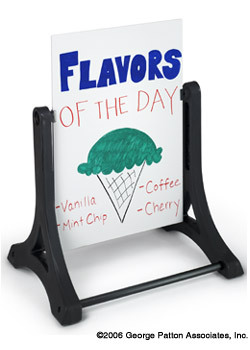 These menu boards, likewise known as sidewalk marker boards, are perfect for bakeries, delis, and restaurants. 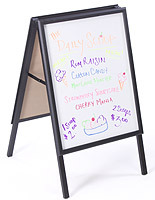 Sign supplies designed for sidewalk use, like these food list boards, are an ideal method to greet clients at your shop front to display daily or weekly deals. By utilizing adjustable communication boards and write-on/wash-off markers, these sign supplies enable you to alter your message as often as you need. Meant for outside usage, these sign supplies are long-lasting merchandise that will remain steadfast even in rainy or windy circumstances. 25.3" x 31.0" x 24.0"